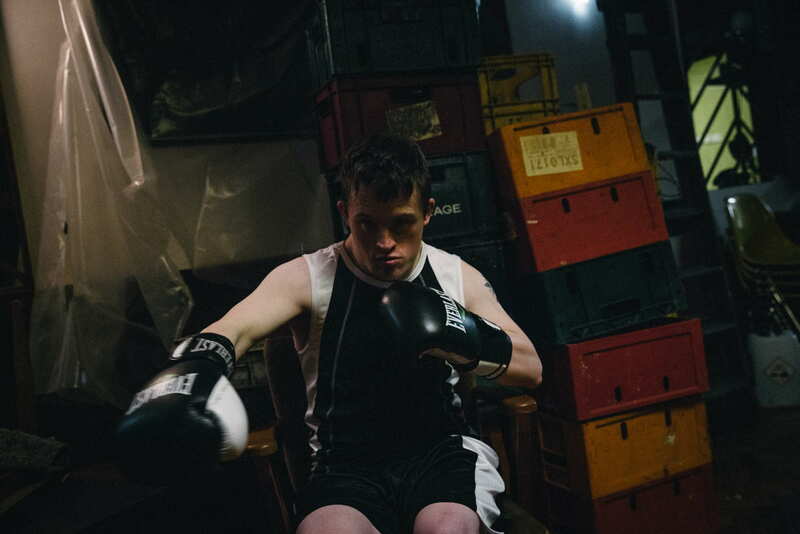 Unfolding in the tension filled moments backstage before an amateur boxing match, Bugsy Riverbank Steel’s visceral short Fighter depicts a Down’s syndrome athlete torn between the bullishness of his overbearing trainer father and his protective sister’s coddling fear for his safety. 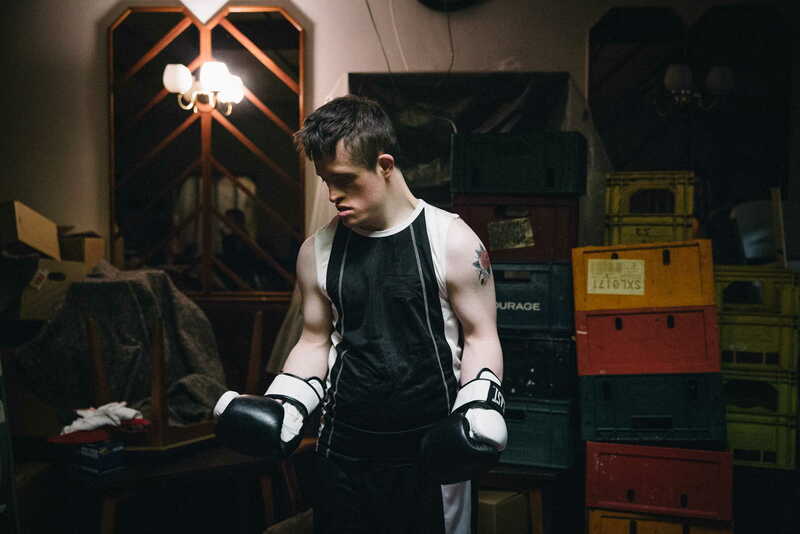 Part of London Callings’ London Film Festival selection of shorts from up and coming filmmakers, DN asked Bugsy to tell us more about the creation of this human drama about one man’s fight to follow his dreams. The idea for this film was inspired by an article I had read about a guy with Down’s syndrome in America named G-Money who had been fighting the courts and press to be allowed to compete in MMA (Mixed Martial Arts). Although inspired by his real life struggle, we didn’t want to write about his experiences but instead wrote our own story set in the world of British Amateur Boxing. Guy Bolton (the writer) and I wanted to make a film that not only showed a person with Down’s syndrome in a different role, but a role that was powerful, heroic and strong. There has been a lot of talk in the media about the inclusion of disability in film but rarely in a way that doesn’t show them as a victim and so I hope we have shown a different and more original angle to Down’s syndrome through our simple and small film. Once given the green light in what ways did the London Calling scheme shepherd and assist the project through production? London Calling were great. Out of over three hundred submissions Fighter was selected as one of forty to put together an initial proposal and pitch. We were then awarded the funding along with twenty other films. When going into this scheme I was less interested in the the funding and more in the platform that Film London provide. Throughout production we had weekly workshops on the various aspects of making a short film, then a director workshop at RADA where a mentor director took a small group of us through scenes from out shorts. But most importantly we got feedback from script to edit. We were lucky enough to have Angeli Macfarlane throughout our project. She provided vital critique and notes that helped to shape the film and our process and this is why London Calling is such a great scheme. How did you go about casting the film? 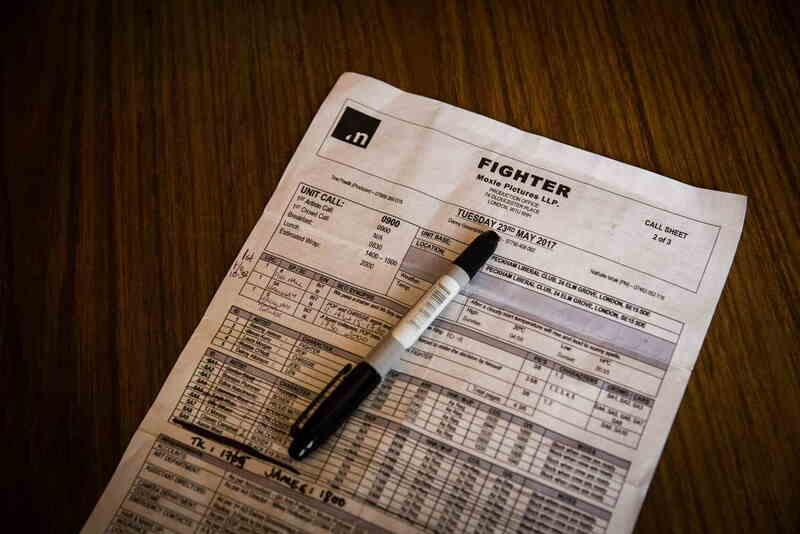 We put a lot of time into the casting and were lucky enough to find Tommy Jessop who plays the Fighter. He had plenty of acting experience but knew nothing about fighting. So through a few contacts we were able to get in contact with Ryan Pickard, the captain of the infamous Repton Boxing Club in East London. He kindly trained both Tommy and Simon Kunz (who played his father/coach). This amazing training opportunity was not only to get both them looking believable but during this process they formed a close relationship which I hope comes across on camera. Were there any considerations you needed to take into account when working with Tommy in order to account for his disorder? I hadn’t ever worked with someone who had Down’s syndrome and I had some trepidation when going into this project so spoke to a number of directors and theatre groups to get advice. But once I got into the project I soon realised that my fear was born out of ignorance. My approach to Down’s syndrome has completely changed since working with Tommy. Tommy is a trained actor through and through. He not only knew his lines but everyone else’s, he was prepared and ready at every step of the shoot and super professional. My approach to Down’s syndrome has completely changed since working with Tommy and that’s why I feel that we definitely need more inclusion of Down’s syndrome in mainstream media. There’s a great sense of ambiguity throughout as to the extent of the Fighter’s desire to go into the ring vs his overbearing father pushing him to do so and his sister’s concern. How did you navigate that balance of not tipping the audience too much in either direction? Ambiguity was our main objective for this film and we knew that not only did we not want to choose sides, the film depended on us getting that across and right. This was harder than it sounded and we actually ended up having to cut bits out as they were weighing too much in one direction. The ending was always intended to rest on his choice and hopefully leave the audience thinking. I did shoot an alternative but as predicted it didn’t work but you can never tell so always worth having a back up. The handheld cinematography imbues the film with a fitting nervous energy. How did you develop the visual style and what was your set up for the shoot? From the very beginning I felt this had to be handheld, energetic, real and observational. The style had to keep you on your toes and be in your face, building the pressure with every scene. We shot single camera (Alexa) at a working men’s club in Peckham until the third day when we were lucky enough to have two cameras and one on a steadicam. This allowed me to get the rotating sparring scene which I had planned out and didn’t think we’d have the time to get but truly came to life in the edit. The DOP (Jann Doppert) wanted to light the rooms practically so that we could shoot quickly without having to constantly shift lights. This is a great move when you don’t have much time to shoot and in our case it helped a lot. The writer and I were really excited by the idea that this film was always in a back room but I knew that we needed to see the fight and I knew we needed to cheat its relation to the back room so it all felt like one location and one place in time. I therefore spent months tracking down and contacting fight promoters and clubs across London, until I finally found one willing enough to let us film their fight for free. After chatting to Ben Wheatley and some other directors, I was advised to not get stuck trying to get my feature funded and make a homemade, no budget feature. So I’ve written a thriller set in the world of the homeless and I hope to be shooting early next year. I also have a project with the writer from Fighter about a child street fighter which we are looking to make as soon as someone gives us some cash. As well as this, I have a few more things ready to go and hopefully this short film will be able to get these projects in front of the right people.